The book is divided into three sections by yarn: Rare Comfort Kid Mohair, Silkroad Aran Tweed and Classic DK Wool. 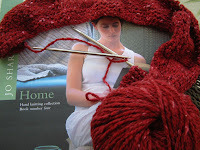 These sections are then broken down into photographs of projects and photos of the colourways in each yarn. At the end section of the book are the patterns. These are also grouped according to the yarn with information about how much experience the knitter will need. The instructions are clear and there are charts for pattern work. This book is lovely to snuggle down to on a lazy day and dream of all the homely projects you might wish to make. Let the descriptions and the images wash over you and soon you will be inspired to begin your knitting using her soft enveloping yarns like warmth for Harvey.